I think I’m going to enjoy my new job. I bit the bullet and became self employed to run workshops in felt making and knitting. I spent all yesterday with a fabulous group of ladies playing with recycled jumper fabric and wool. 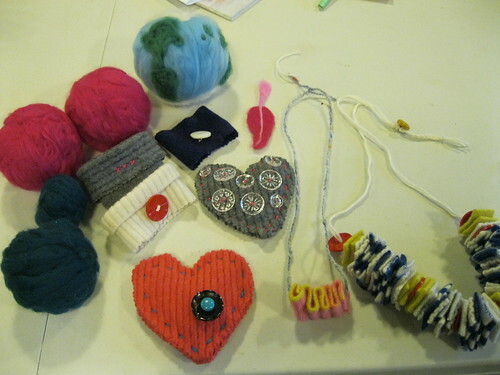 In the morning we made cards, necklaces, bangles and lavender bags using felted jumpers, then after a fabulous artisan lunch I taught the basics of needle felt. It’s a good job I had stocked up on the needles as many were broken during the session, there were a few puncture wounds too when the ladies got carried away and took their eyes off what they were doing. There is only so any times I can say ‘watch what you’re doing’. I showed the ladies how to make quick felt balls and shapes using cookie cutters and the afternoon whizzed by with the help of tea & cake. Cate had made wonderful cake for us to enjoy with our morning coffee & afternoon tea. The Barn at Much Ado books is a great place, the Aga keeps it warm and the decor is homely & chic. I’m hoping this will be the first of many workshops I run there. Cate & Nash are great hosts. Your workshops sound like great fun. Where are they held? Do you know when the next one is? I’m hoping to do another at the book shop in Alfriston, but have another planned at my friends alpaca farm in April. Where are you? I want to set one up in Lewes or Uckfield too. I’m in Eastbourne so any of the venues would be OK. I’m mainly a machine knitter but I like to dabble as we all do!!! I have done a little felting(wet,fulling and needlefelt) but would be interested in playing a bit more. Have made felted jackets on machine but the idea of combining techniques for embellishment seems endless. Look forward to hearing from you soon. I’m sure if you contacted Much Ado book shop in Alsfriston they will add you to the list for the next workshop. We haven’t got a date yet though. there is a scheduled workshop at the book shop to make tea cosies on 11 June. Booking through the shop. Am also just organising alpaca felt workshops in Fletching at Spring farm, possbily 8th June and 26th June. You will get to meet the animals before learning needlefelt.